Be imitators of God as dearly loved children. Build each other up. Encourage one another daily. Don’t just look out for your own interests, look out for the interests of others. Do nothing out of selfish motives or vain conceit. Love God with all your heart, mind, soul, and strength; love your neighbor as you love yourself. This is the greatest commandment. The words above are from the Bible. Many are from Jesus. I’d love to tell you that I always think love is a good idea. I don’t. Sometimes the logical response for me is to choose isolation from people and forgo loving anyone but God. As an introvert, loving people is sometimes exhausting. Sometimes, honestly, love feels like a waste of time. Just keeping it real…yet part of loving God is loving people, not just in word but through actions. Guess what? No one bears more scars than Jesus. We cannot fully comprehend the pain our sins caused Him. He was marred beyond recognition. His friends denied Him, forsook Him, and betrayed Him. Love cost Jesus everything. He felt the weight, shame, and pain of every sin. This same Jesus says to us, “Love as I love.” He gave us His Spirit to help us to love. He doesn’t ask us to do anything He has not done or will not empower us to do. So what are we to do? Do we throw in the towel on this love thing? We could, but we would be living a life in disobedience to God. God never gives us permission to stop loving people. He never gives us permission to hold grudges or withhold forgiveness. If we don’t forgive, we are not forgiven. God never stops loving. He said the world will know we are His by our love for one another. If we don’t love, we don’t know God. You see the point of life is to be loved by God, love God, love people, do as Jesus does, & become like Him; not by striving, but by abiding in Him. We are transformed by relationship with God. We are being transformed by what we love and worship. Hence God saying, “Love Me most! Love Me first. Have no other gods before Me!” We are slaves to who and what we worship and obey. We are God’s Ambassadors on earth. We show and demonstrate to the world what He’s like. Do you know anyone who reminds you of Jesus? Do you know anyone who represents Him well? Does the person you see in the mirror continue to grow into His likeness? Sanctification (the process of growing more Christlike) is part of the Holy Spirit’s role in our lives. We can quench Him, resist Him, ignore Him, and offend Him. Yet He’s trying to work in us so we represent the Father well and become our truest selves. Our world needs Christians who look, behave, and sound like Jesus. They’ve heard our sermons and worship, listened to our political agenda, but have they encountered Jesus? Have they seen Christ in us? I ask these questions of myself. Am I becoming more like Jesus or more selfish and like the world? Am I loving people or harming them? Am I giving/serving or asking to be served? Is my life a reflection of His love and power? When God reveals weaknesses (which I have plenty of), am I asking Him to help me or making excuses for them? Lastly, though I feel it at times, love is never wasted. People are not our audience, judge, or jury. We love and live for an audience of One. Every person will give an account for their lives. We are called to care more about what God thinks than people’s responses to us or their opinions. It’s for His Glory, not our own. May we choose love. May we abide in the One who is love so we have love to give away. May we be known for looking, acting, sounding, and behaving like Jesus. He said those who abide (remain) in Him will bear MUCH fruit (John 15:5). 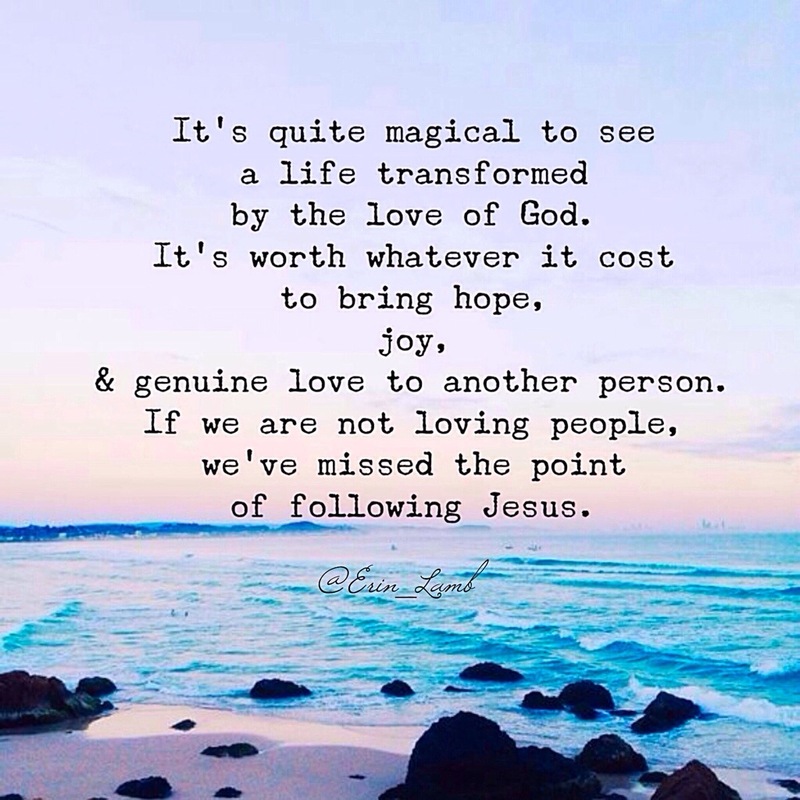 I don’t know about you, but I desperately need Jesus to love people, including myself. Without God I am nothing and have nothing. Have a blessed week! Be a blessing to others. The world needs what you’re carrying…Christ in you, the hope of glory. Love is never wasted. We are transformed by who and what we love. We are becoming like the object of our worship. “Our world needs Christians who look, behave, and sound like Jesus. They’ve heard our sermons and worship, listened to our political agenda, but have they encountered Jesus? Have they seen Christ in us?” Amen! So beautifully said. It’s not enough to preach about Jesus, we must become more like Him every day and reflect Him well to the world around us through our actions. Great post Erin! Thanks Anna! We are called to show the world what God is like and if we don’t, we are helping the evil one succeed. We re-present God to the world, His image bearers.